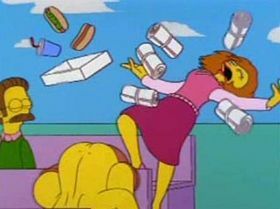 While The Simpsons has already paid tribute to the late Marcia Wallace through two shout-outs in the credits, last night her death finally made its way to Springfield proper. The epilogue to the latest futile Sideshow Bob caper featured the emotional rake to the heart-face that was Ned Flanders dreaming he was doing a God-riling tango with his wife (yes, his wife), Edna Krabappel, only to awaken wearing a black armband and sighing somberly, “Sure do miss that laugh.” Nelson—who just happened to be skulking around Flanders’ open window, apparently—also pops up to laugh at his grief, before saying he misses her too. Producer Al Jean said previously that Mrs. Krabappel would be “retired” from the show, and it’s been unclear ever since how that retirement would play out. But judging from this, she’s simply been allowed to die peacefully—and so far, inexplicably—off screen, presumably with an in-world explanation to come later. As far as the wives of Ned Flanders are concerned, it’s definitely the most dignified way to go.